Students will learn to use different techniques, all traditional, to include hooky, proddy with a bodger and a peg, and braiding . 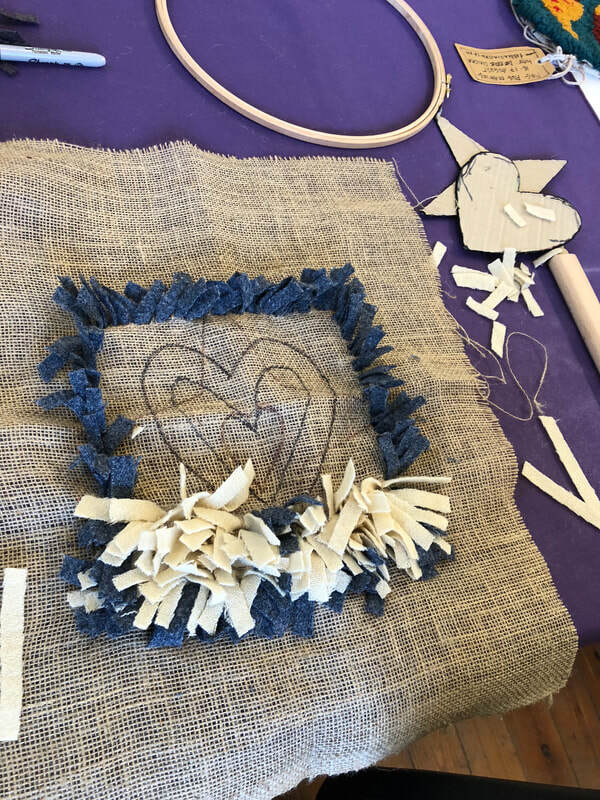 This craft is about recycling, and old sweaters, teeshirts and other stretch knits can be used to work into a tactile, functional and homely rag rug. We will work designs, onto a hessian backing, and make a start on a small slip mat, or sofa cushion. Braiding wide strips of blanket to be plaited, coiled and stitched into an oval, to form a floor mat. Backing – turning raw edges over and hand stitching , and attaching a backing. Materials are not included in your course fee. Students can buy a kit which will include hessian, instructions, peg proddy tool and some strips of fabric: cost for this kit is £5. Other hand tools will be provided for use in class, with the option to buy new tools at the end of the session. These include, rug hooks, bodgers, cutting gauges and extra hessian. 12” quilters hoop or embroidery hoop. Any stretch knits like felted fine knits, tee shirts, sweat shirts etc. You can also use cotton shirts, and other cottons. No upholstery fabrics please, they will be too heavy. Old blankets if you have any. Scissors, needle and strong thread, notebook/pen and a magic marker if you have one.